In a Nutshell: CreditRepair.com takes an ethical and comprehensive approach to credit repair. Rather than embracing the unethical strategy of disputing every negative item on a credit report, this agency favors a more complex investigative strategy that is three-pronged: Communications are directed to creditors and consumers, in addition to the credit bureaus, to help improve your credit profile. 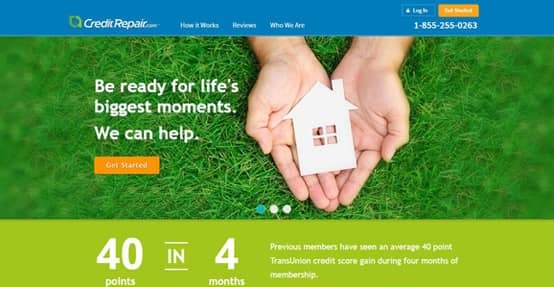 Members see their TransUnion credit scores improve, on average, 40 points within four months of enlisting these services. To help people achieve long-lasting financial success, CreditRepair.com goes to great lengths to educate consumers about their rights — and how the law can work in their favor. A few years ago, Gina Taylor fell on tough times. This mother of three and grandmother of four was unemployed for six months, and she was forced to live solely on credit to get by. She made it through and found a steady job, but it took a toll on her credit score. After six months of building debt, her credit score had plunged to 633. She was desperate to get her finances back to where they had been, but didn’t know how to fix her credit. Then, inspired by an ad she heard on the radio, she consulted with a trusted credit repair service: CreditRepair.com. With the help of CreditRepair.com, she was able to raise her score from 633 to 708 in just five months. This kind of success is commonplace at CreditRepair.com; its reviews page is full of similar positive testimonials. Previous members have seen an average 40-point TransUnion credit score gain during four months of membership. The site offers this track record as an indication of past results, not a guarantee for prospective clients. Even in its marketing, CreditRepair.com endeavors to be up front and honest with members. This credit-repair service takes a multi-tiered approach to boost credit scores and rid members of negative items, making sure that all items on your credit report are accurate, fair, and substantiated. Members can track CreditRepair.com’s progress on their own desktop or mobile device. The mobile app is available for download on any iPhone, iPad, or Android, offering 24/7 access to a personal online dashboard as well as a score tracker and analysis tool. To further keep you in the loop, CreditRepair.com will also send text and email alerts about any notable updates on your credit. A results-driven leader, Scott tells us that his team works hard to be a user-friendly and effective solution for members. Unlike some of its competitors, CreditRepair.com isn’t interested in playing the blame game or promising more than it can deliver — these consumer advocates fight for the rights of members without vilifying anyone. You can call 1-(855)-255-0263 for a free consultation with a communications specialist. Then, for a small monthly fee, CreditRepair.com will rigorously pursue your best interests. Once a member signs up for CreditRepair.com, the team gets to work. The first step: check in and see what’s going on. After taking stock of the credit report, the person’s background, and what needs to be addressed, these professional problem-solvers come up with a plan of action. CreditRepair.com works in close consultation with members and the three major credit bureaus to gather information before taking appropriate actions on specific items. 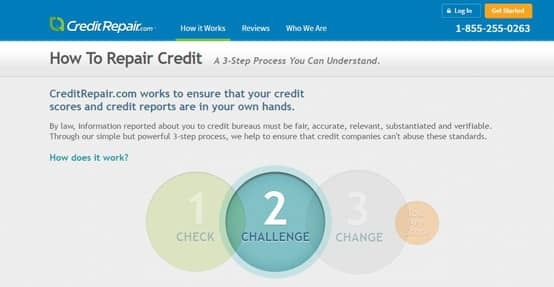 Instead, CreditRepair.com opens a dialogue between the member, the creditor, and the credit bureau, framing tough questions about what’s impacting a credit score. These experienced agents stay in close communication with all three parties and argue for fairness and full substantiation, which sometimes involves making a dispute and sometimes does not. CreditRepair.com makes personalized recommendations that fit the member’s particular needs and goals. As a result of this team’s hard work, members often see inaccurate, unfair, or unsubstantiated reporting corrected on their credit reports. Improving a score doesn’t necessarily mean waging war to dispute errors, but simply knowing what consumer protections can benefit members. CreditRepair.com separates itself from its competitors by being open to every means of achieving an improved credit score for its members. On average, CreditRepair.com members have 7% of the negative items on their credit reports removed per month. CreditRepair.com is equipped to handle many different situations — whether you’re saddled with an ex’s credit mistakes after a divorce or you come home from military service to find a pile of financial troubles in your mailbox, Scott’s team can speak on your behalf. When facing a serious problem, you can trust this group of individuals to fight for you with the utmost integrity. Instead of simply filing disputes and seeing what comes back, this team comes up with a nuanced game plan based on your particular issues and struggles. Sensitive to your needs, CreditRepair.com works diligently to make sure that your credit report accurately reflects your financial history. CreditRepair.com seeks enduring results, using preventative as well as reactive measures to help people out of their financial troubles. By educating consumers, the team hopes to put people on the path toward solid credit. Many times, they find that members simply don’t know what good credit behavior is or the consumer protection laws that exist to help them. Members can speak to CreditRepair.com about these issues by phone, email, text, or chat. Moreover, through its blog, articles cover a broad range of financial topics from prepping for baby expenses to saving for retirement. The education section of CreditRepair.com, which explains loans, savings, credit improvement, debt solutions, and identity theft, informs readers about important subjects that could affect a credit score. The consumer advocacy company is committed to raising awareness in the U.S. and puts its money where its mouth is with the CreditRepair.com Scholarship Program. This scholarship opportunity is open to students for the fall and spring semesters, awarding a total of $10,000 dispersed among six lucky entrants. To apply, CreditRepair.com has students write an essay about credit, essentially teaching a large number of young adults how important a credit score is. The earlier an individual learns about credit and how to treat finances, the better off they’ll be down the road when they’re actually faced with tough decisions about how to use and maintain their credit. CreditRepair.com invests in building this foundation for long-term and lasting well-being for all Americans. If you’re like Gina and need some help raising your credit score, you’ll find a supportive team ready to assist you at CreditRepair.com. Creating a strategy based on your individual situation, this company uses tactics that go beyond disputing errors on your credit report. Instead, the team takes advantage of all consumer protections out there to challenge questionable information that’s hurting your credit. The company’s broad approach has been tested over time. Ethically and responsibly handling all personal information, CreditRepair.com challenges any inaccurate, unfair, or unsubstantiated information on a member’s credit report. Members can rest easy knowing that this credit repair service has the experience to rectify any issues and help raise their credit scores. “At CreditRepair.com, all our consumer advocates are focused on making your best credit profile their first priority,” Scott says. Amber Brooks is a Contributing Editor at Digital Brands. She spends her days consulting with financial experts to bring readers the best recommendations and tips on the web. She's interviewed financial leaders from all around the world. With a background in writing, she's uniquely suited to diluting complex financial jargon into terms that are easily understood. When not obsessively budgeting out her days, Amber can often be found with her nose in a book.